With help from teachers Gene Montooth, John de Lancie and Richard Woodhams, I received my BMus (Shenandoah Conservatory) and MMus (Catholic University) degrees in oboe performance. I have appeared as soloist, chamber musician and clinician with orchestras across Canada, Europe, North and South America and Japan and have been principal oboist with the National Arts Centre Orchestra, the Toronto Symphony and Boston Symphony Orchestras. Currently, I am principal oboist with the Canadian Chamber Ensemble and the Kitchener-Waterloo Symphony, and each year I participate in summer music festivals, including the Elora Festival, Festival of the Sound in Parry Sound and the Cambridge Arts and Music Festival in Cambridge, Ontario. Laurier Alumni Association’s Faculty Mentor of the Year Award (2009). 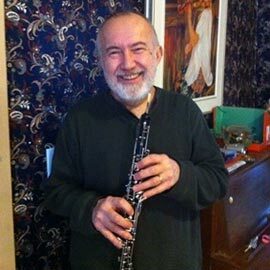 James Mason Oboe Scholarship, a scholarship started by Jim’s former students. Kitchener-Waterloo Arts Award for Music (1999). I think that teaching should be about educating, guiding and inspiring the student. The teacher, at the university level, should be the student's #1 advocate. I feel that the Faculty of Music at Laurier allows and encourages this relationship between teacher and student.